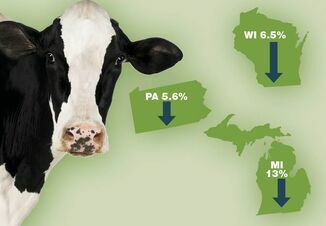 The 2016 Midwest and Eastern US forage crop is projected to yield greater milk volume, measured by pounds per cow, based upon nutrient content and digestibility trends. However, the 2016 corn silage and high moisture corn harvest brought unexpected challenges for much of the US, leading to delayed harvest and plant and grain maturity advancing beyond ideal stages. Further, nutrition-robbing factors are present and now becoming a considerable point of discussion. Based on recent support call frequency, many within the dairy industry are not recognizing optimal performance. Dairy farms seem to be enduring more variation in health, reproductive performance, nutrient digestion and overall dairy performance. Unfortunately variation cannot always be pinpointed toward one culprit. Any lessened health and performance is almost always due to multiple factors. These insults can come together, creating a perfect storm to depress animal health and performance. Historically, mold, yeast, and toxin counts have been the industry's focus when evaluating anti-nutrition factors. Wild yeast has been shown to negatively affect the rumen's ability to metabolize nutrients. While mycotoxins are understood to affect reproductive performance, suppress the immune system, affect the central nervous system, and damage the liver, kidneys, and gut tissue. There are always multiple mycotoxins present, and sometimes they will act synergistically, similar to being kicked in the shin and the backside at the same time. A healthy dairy cow can usually fight off harmful bacteria with relative ease but when other factors or stressors suppress the animal's ability to fight, these bacteria can colonize and exert their harmful effects. Clostridium and E. coli have been implicated in hemorrhagic bowel cases, while Salmonella can severely affect the nervous system. These bacteria are increasingly identified as the industry strives to fine tune animal nutrition programs. Recent laboratory measures for enterobacteria in total mixed rations and individual feeds indicate that many samples are beyond the 100-colony forming unit per gram (CFU / g) concern levels, indicating the potential for challenges if other toxins or stressors are also affecting animal health. 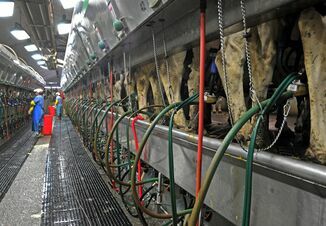 While these cases of multiple factors working negatively within the animal can be grim, there are opportunities to defend production and combat these factors. 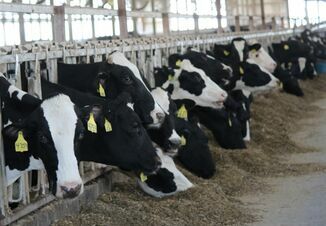 If dairy or feedlot health has been challenged with symptoms similar to those discussed and performance is less than expected, consider evaluating bacterial contamination in addition to mold, yeast and mycotoxin concentrations. Work to minimize bacterial contamination by keeping equipment and bunks clean and limiting soil contamination. And make sure to consult with trusted veterinary and nutrition advisory teammates, understanding that several factors can unfortunately synergistically work against animal health and performance. From a nutrition standpoint, dairy producers and their consultants should work to minimize starch entering the intestine and hind-gut. Excess starch can create favorable gut conditions for mold and bacterial infestation. Producers should consider evaluating TMR rumen in situ starch digestion to determine if excess starch is passing the rumen [in situ rumen starch digestion less than 65 percent of total starch]. As the winter brings challenges of its own, it's still important to monitor all aspects of the daily dairy cow's routine to proactively mitigate risks, or combat those challenges if they do cascade into bigger concerns with negative results. As anti-nutritional factors continue to threaten dairy productivity and health, adhering to observation, analysis, research and advisor's recommendations could be the best new year present you give your or your clients' cattle.